Gogoro will lend its modern vehicles for the first ever scooter sharing program in Berlin. Berlin proposes the new concept of scooter sharing, which comes as a progressive move after the car and bicycle sharing introduced in other cities. Gogoro, the Taiwanese company, partnered with a Bosch subsidiary to offer two-wheel transportation to Berliners. The program will initially involve 200 Gogoro smartscooters which will be available in the neighborhoods of Mitte, Friedrichshain, Prenzlauer Berg and Kreuzberg. The scooters could be used by licensed drivers that have the age over 21, after installing the Coup app. The price for one Gogoro will be of $3.36 for 30 minutes or $22.40 per day. Coup officials say that current sharing services have issues like congestion, replacement problems, billing by minute and parking difficulties that are not consumer friendly. The new scooter sharing can, therefore, improve mobility in Berlin. The new vehicle had been first presented in 2015 in Taipei and later at CES in Las Vegas. The company sold more than 10,000 scooters in less than a year and had installed 225 GoStations in Taiwan. The company officials explain that its two-wheelers helped to save 850,000 liters of gas and avoided 1,643,000 kilograms of carbon dioxide emissions. The scooter is available at a price of $4,100 and benefits from an excellent battery-swap program, as dead batteries can be replaced in special kiosks at a cost of $30 per month. As for its technical qualities, the vehicle can accelerate to 30mph in 4.2 seconds. Its maximum speed is 60mph. The smartscooter is all electric, and its design is inspired by Formula 1 racing. The ride is supposed to be smooth, easy to control, and offer a feeling of flying. The suspensions have been made taking the example of jet-fighter landing in the front, while the back has a multi-link suspension. The device is digitally optimized and fully integrated. 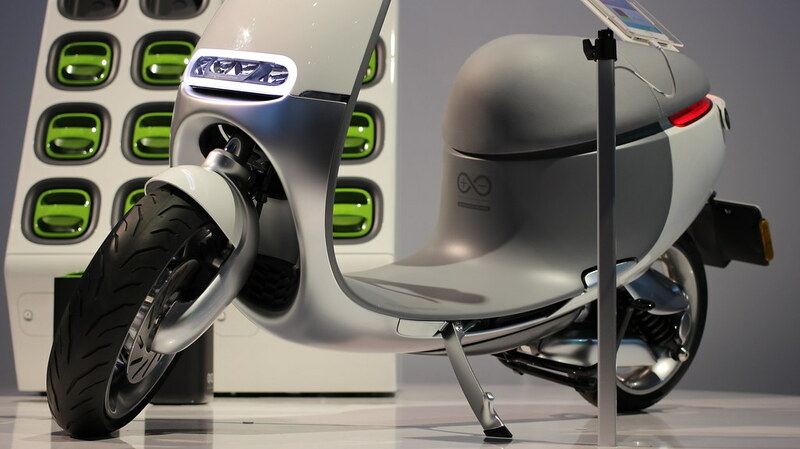 It is energy efficient and uses a G1 Motor that stays cool as it uses the scooter’s aerodynamics and the passageway network to make the air flow inside its gears. The Berlin scooter sharing program will include the Coup app, which will help users to find, book and pay for a vehicle. The app can also monitor the vehicle’s health, provide diagnostics and track the rides. However, the European market is still young, and the manufacturers rely on the sustainable and innovative sides of their smartscooters to convince the clients on the old continent.